Summary: It’s a reminder of what Favreau can do, and the rest of the film would have benefited from a similarly disciplined approach. 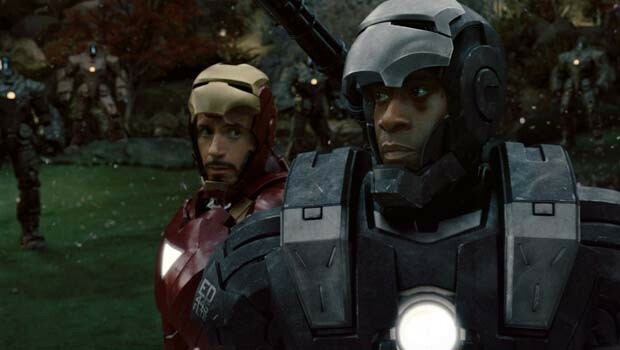 It seems unthinkable now, but back in 2008, Jon Favreau’s Iron Man was something of a gamble. It was a huge step up in scale for the filmmaker, and even more so for his star, the temperamental character actor Robert Downey Jr. They played to their strengths, and the result was something like movie magic: Downey’s excellent performance boosted him into the movie stratosphere, he followed it with a hilarious Oscar-nominated turn in Tropic Thunder and cemented his status as box office gold in the much-loved Sherlock Holmes. Favreau had succeeded in pleasing audiences and critics alike by putting some fun back into the superhero genre – a nice counterpoint to the sombre Dark Knight that same year – and he was quickly entrusted with the Iron Man sequel. The question was, after the original’s unconventional ending in which the hero revealed his secret identity, where would Tony Stark’s story go next? The answer, as provided here by Favreau and writer Justin Theroux is “nowhere particularly interesting”. Despite – or perhaps because of – having an embarrassingly great cast in place, including all the original stars (except for Terrence Howard, cheekily replaced by Don Cheadle) and new and equally well-chosen additions Rourke, Rockwell and Johansson, Favreau has lost the emphasis on character that made the first film so compelling. Instead this film offers a series of carefully-planned, effects-heavy sequences strung together with slapdash storytelling, underdeveloped character ideas and the occasional funny line of dialogue. It starts promisingly, noticeably darker than Iron Man left off, introducing Mickey Rourke’s embittered Russian scientist Ivan Venko, and presenting Stark as even more narcissistic than before. After some plodding courtroom banter over the legality of Stark holding onto “the Iron Man weapon”, Favreau zips location to the glitz of the Monaco grand prix and unleashes a killer set-piece. Cars fly across the screen and Rourke steps out from a huge explosion cloud like a laser-whip-wielding angel of death; it’s ridiculous, but enjoy it, because it’s as exciting as Iron Man 2 gets. After establishing Venko as a villain capable of doing some real damage, Favreau shifts the focus onto Stark’s business rival Justin Hammer (Rockwell), and Venko becomes a surprisingly controlled screen presence. The film never recovers from that shift, as Favreau fails to make it clear who the main bad guy is, what kind of threat they pose and to whom. There is the suggestion in the film’s first half that the greatest threat to Tony Stark may be himself, both in terms of his super-powered technology and his self-destructive temperament. This is the direction that Favreau had hinted that he might take the Stark character, but it remains just a hint in this film, with Stark comfortably overcoming such pressures without much drama. Curiously, Favreau sets all of the aerial action at night, meaning it’s often hard to make out what Iron Man is actually up to when he’s flying around. Much more satisfying is a late-in-the-game punch-up between Scarlett Johansson’s Natalie and a host of security guards, in which the slinky actress demonstrates a previously untapped skill for bone-breaking martial arts. The scene is tightly edited and has a neat and funny payoff. It’s a reminder of what Favreau can do, and the rest of the film would have benefited from a similarly disciplined approach.